Wuganmagulya (Farm Cove) is an installation honouring the original Yura clans of the site and those Indigenous people who held ceremonies here. Incorporating such elements as stained concrete, terrazzo and engravings, the work is integrated into the harbourside pathway at Farm Cove and acknowledges the Indigenous life and natural elements of the surrounding environment by the use of colour and texture. The artist who created the monument has cultural affiliations to the 'Gurindji, Malngin and Mudpurra peoples'. This artwork commemorates the historical and contemporary presence and importance of Indigenous people in this part of Australia. 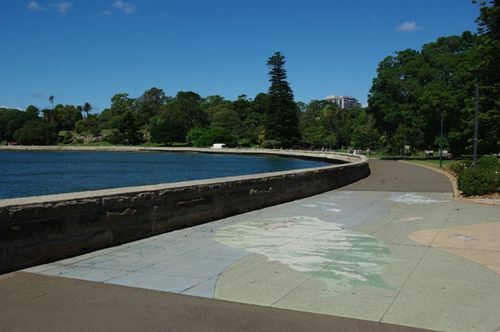 In two sections of the pathway terrazo and stained concrete depict figures from Sydney Aboriginal rock carvings, some of which no longer exist, in colours that reference the natural elements of the surrounding environment. The names etched in red along the pathway kerb are of women and men, places, animals, tools and rituals from the many clans and language groups of Indigenous people in the Sydney area. Wuganmagulya (Farm Cove) pays homage to the Yura (original clans of the site) and to the Indigenous clans who travelled great distances to attend ceremonies at Sydney Cove. It also acknowledges contemporary Indigenous history such as the 1988 Long March of Peace, Justice and Hope through the city, Domain and Gardens in protest of the Bicentennial Celebrations, and celebrates the survival of Indigenous Culture. The artist, a member of the Gunindji nation, consulted with Alllen (sic) Madden, Culture Heritage Officer, Metropolitan Local Aboriginal Land Council, to ensure correct cultural protocols were followed.